Big Road Blues Discussion Forums • View topic - volume reducer pedal effect? but the problem is, the volume is overwhelming even with the keyboard's volumes at its lowest, and there is no volume control on the particular amp input. I what I'm asking of you all pedal effect aficionados, Is there a gizmo I could put between the keyboard output and the AUX input that I could use to reduce the volume? Les, I don't know if this will help, but I think that it might. How about a volume pedal? That is one of my solutions for an instrument with no controls. I am partial to the Dunlop 'High Gain' pedal, but most all of them are good quality. I also built a little volume control box for my tricone which came with a pickup but no controls. I plug that thing into the guitar and the cord into it. You can build one for less than twenty bucks, even if you have to buy all the parts. Re: volume reducer pedal effect? Thanks for the tips Michael. O wait , looking closer it seems like on wire goes straight through and only one wire gores trhough the pot? Nah, there are three contacts on the pot. Oh well, Maybe I can buy one ready made for not much over twice the twenty bucks? Les, the wiring is real simple here. It is basically the same as a guitar or simple pot (volume) pedal. I used a 1 meg pot because that's what I found at Radio Shack the day I bought parts. Any value between 100K and 1M (1000K) should work OK. For my application, I think that 500K would probably have been ideal. 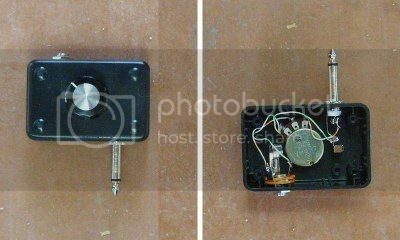 In the photo above, the plug is the input and the jack is the output. The wire from the ground (sleeve) of the input goes to one end terminal (left in the photo) on the pot and then on to the ground lug on the output jack. The hot (tip) from the input goes to the other end of the pot (right in the photo). The wire from the center terminal of the pot (wiper) goes to the hot (tip) on the output jack. That's it. You can't really go totally wrong. If the two input wires are reversed at the pot, it will operate 'backwards'. Any other wiring mistakes, and it probably won't work at all. I don't have any idea where you might buy one, that's why I made that one ... besides having fun. FWIW, before you get too carried away, you might want to just 'breadboard' something together real quick to see if it will do the job for you. I hope that gets it. Have fun! Enjoy.